California affirmative-action ban: Why liberals should let it stand. Why liberals should let California’s affirmative-action ban stand. 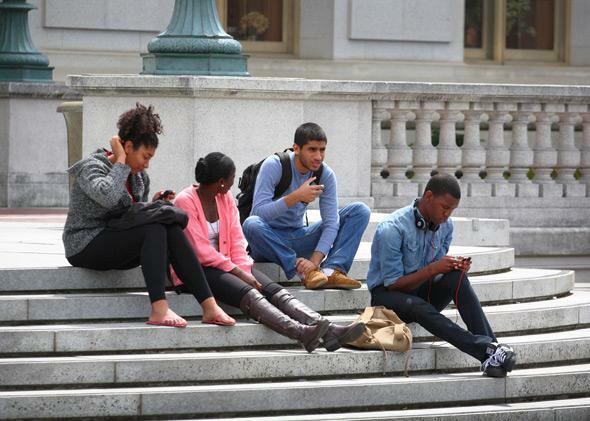 Students hang out on the steps of Doe Library at UC–Berkeley. The university has used socioeconomic factors to boost diversity over the past 18 years without affirmative action. More than 500 Chinese-Americans angrily protested recently in the rain, outside the offices of California State Assembly member Ed Chau. They were upset about a new effort to repeal California’s ban on affirmative action in university admissions. In 1996, California voters passed Proposition 209, the hot-button referendum that barred the consideration of race in public university admissions. At the time supporters, led by businessman Ward Connerly, argued that racial preferences were wrong and that individuals should be judged without regard to skin color. Critics responded that society is not colorblind, and barring universities from considering race would lead to a decline in African-American and Latino representation at elite campuses such as UC–Berkeley and UCLA. On the power of these arguments, SCA 5 sailed through the State Senate earlier this year. But now that the legislation is in the Assembly, Asian-Americans are organizing against it. Under Prop. 209, Asian-Americans have been overrepresented at the University of California, so many community members worry that they would be hurt by its repeal. Meanwhile, supporters of repeal think they have a decent shot of winning because of the explosive growth of Latino voters. Welcome to the current politics of affirmative action, which are far more complicated than black vs. white. Nationally, more than one-quarter of high-school students live in states where racial preferences are outlawed at public universities. (Along with California the list includes Washington, Michigan, Nebraska, Arizona, Oklahoma, Florida, and New Hampshire.) These bans often led to sharp drops in black and Latino student enrollment initially, but over time states and universities adopted a number of race-neutral strategies to indirectly boost their enrollment, such as providing a leg up in admissions to low-income students of all races. In seven of 10 leading public universities, my colleague Halley Potter and I found, these strategies were able to help colleges meet or exceed the levels of African-American and Latino representation they’d achieved in the past with racial preferences. UCLA and UC–Berkeley were two of the exceptions, however. Many liberals understandably support repealing 209 in California to make those universities more racially and ethnically inclusive. But lifting the ban is a bad idea for two reasons. First, under Prop. 209 California has adopted a whole host of terrific measures to boost racial diversity indirectly, mostly by looking at socioeconomic status. Schools have reduced their reliance on standardized test scores for admissions, banned legacy preferences for the children of alumni, encouraged more community-college transfers to four-year institutions, and created new outreach programs to high-poverty high schools. In part because of these efforts, UCLA and UC–Berkeley are far more socioeconomically diverse than most selective colleges. In 2011–12, the proportion of students eligible for Pell grants (federal financial aid for lower-income students) at UCLA was 38 percent and at Berkeley 37 percent, compared with just 13 percent at another top public institution, the University of Virginia. These steps helped accomplish what education is supposed to do—promote social mobility. But they are likely to disappear if universities can go back to recruiting by race. Prestige-conscious universities receive no points from the U.S. News & World Report rankings for admitting low-income students. They’re actually “diverting” funding from things that will boost rankings. That helps explain why most universities create racial diversity by recruiting fairly advantaged students of all colors. Indeed, one study found that 86 percent of African-Americans at selective colleges were middle- or upper-class, while the white students were even richer. To their credit, universities care about racial diversity, perhaps because the lack of it is visible. But they generally do not aggressively pursue socioeconomic diversity except where race has been taken off the table and recruiting low-income students is the next best way to achieve racial diversity. So if SCA5 is not the right answer, what is? How can California’s important gains for socioeconomic diversity be coupled with stronger representation of black and Latino students? One step would be to improve the state’s class-based affirmative action program by considering the net wealth of an applicant’s family, as opposed to only income. Coming from a low-wealth family is a real disadvantage in life, so students who perform well academically despite that obstacle are deserving of special consideration. Moreover, because wealth, unlike income, is handed down over generations, looking at net wealth helps capture the country’s history of slavery and segregation and will especially benefit African-Americans. Eighteen years after California became the first state to ban racial preferences, it should resist the urge to become the first to reinstate them. The state has better options. Correction, March 12, 2014: A previous version of the caption on this article misstated where the students in the photograph are sitting. They’re on the steps of Doe Library, not Sproul Hall.